The IVVCC International Gordon Bennett Rally is on the 6th, 7th and 8th of June this year. We are delighted to say that again it will be based at the Killashee House Hotel. For those of you who are not familiar with the IVCC, it stands for Irish Veteran and Vintage Car Club. The rally commemorates the Gordon Bennett Race held in Ireland in 1903, which was the forerunner of modern Grand Prix racing. (http://www.ivvcc.ie/php/site.php?page=gbregistration2013). The event is open to cars manufactured before 31st December, 1930. 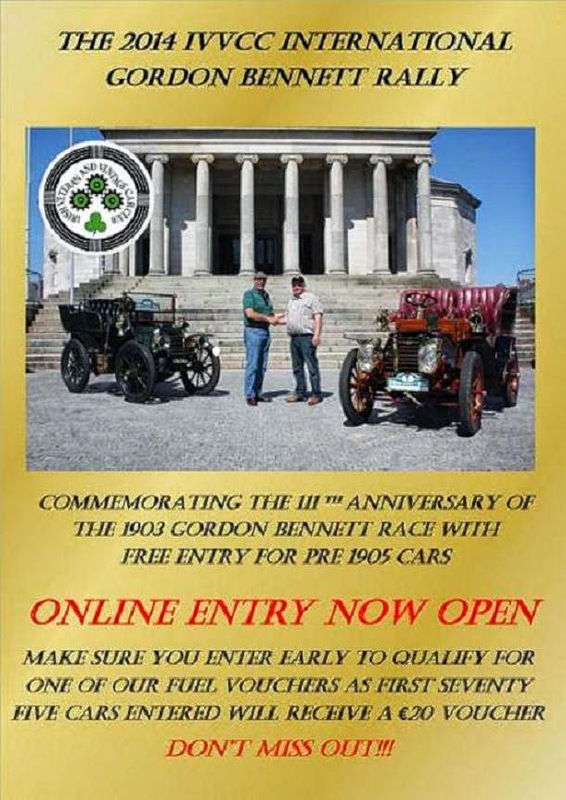 This year is the 111th anniversary of the original race and to promote early motoring we are inviting antique class cars (pre 1905) which would have been on the road at the time of the Gordon Bennett series to take part. See the photos from the 2013 rally at the hotel. Click here!! This rally draws approximately 175 car entries. These competitors come across the globe to take part, with some competitors from Australia, America, UK & Ireland. It really is a sight to see & well worth the time to stand out and watch them pass by you as you take a trip down memory lane or back in history (depending on your age!!). A distance of approximately 90 miles is covered with the route and it consists of time regularity and free driving sections. This rally gives you a chance to see the fabulous scenery around Kildare & Laois. It’s not all about driving and scenery though, it’s more about the social aspect of the event. With Killashee House Hotel as the base for the event; Accommodation, BBQ, Dinner and Good Fun is all to be had at Killashee for the Weekend. This rally is not one to be missed. For updates and information check out the IVCC’s facebook & twitter pages.